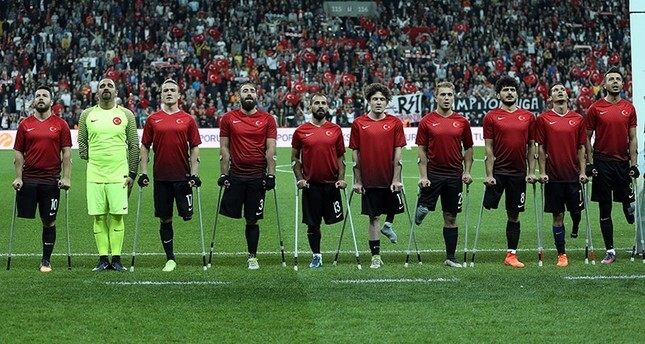 Turkey's national amputee football team on Monday beat England 2-1 at the European Amputee Football Federation (EAFF) European Championship final match to be crowned European champions at Vodafone Park in Beşiktaş district of Istanbul. An emotional evening in Beşiktaş' home stadium proved to be a title night for the Turkish team that scored the winning goal in injury time to claim the European title. Turkey led 1-0 at halftime thanks to a goal in the 25th minute by Ömer Güleryüz. Although the dominant display from the Turkish team continued until the final minute, England's Ray Westbrook still managed to tie the game in the 50th minute. However, Turkish team captain Osman Çakmak scored two minutes later to give Turkey the title. Amputee football games last 50 minutes, i.e. two halves of 25 minutes. Turkey defeated Germany 8-0, Georgia 9-0, Spain 4-0 and Russia 2-1 before reaching the semi-final. Twelve teams attended the championship including Turkey, Belgium, England, France, Georgia, Greece, Germany, Irland, Italy, Poland, Russia and Spain. Turkey ranked second at the EAFF European Championship in 2004 and 2008, and third at the World Championship in 2007. The amputee football national team is part of the Turkish Disabled Sports Federation, supported by the Turkish Football Federation's "Turkey Plays Football" program.